As the age old question goes, “When a tree falls in the forest, can you hear it?” How about when fifty trees fall? How about approximately fifty trees per golf hole and 900 trees total? Whatever the exact number may be, when that many go down, you bet people hear it. In July 2015, a storm blew through the Nisswa/Brainerd area and wreaked devastation on trees due to straight line winds. Thousands went down in the area and The Classic golf course was right in the middle. Long revered as one of the nicest courses in the state, the big question golfers had after the storm was – how’s the course? The answer three years later – it’s better than ever. How does a storm with such damage create better conditions for a course? By providing better air flow, aeration, and turf conditions – that’s how. 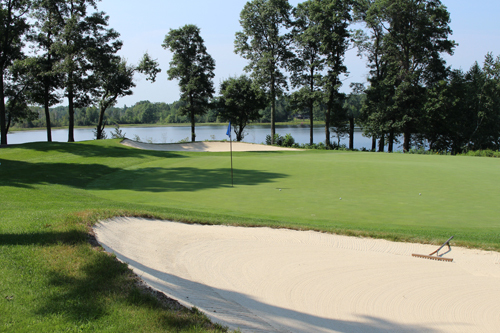 Our recent visit to The Classic revealed a course that should be at the top of the list for every golfer in the state and those visiting from area across the Midwest. 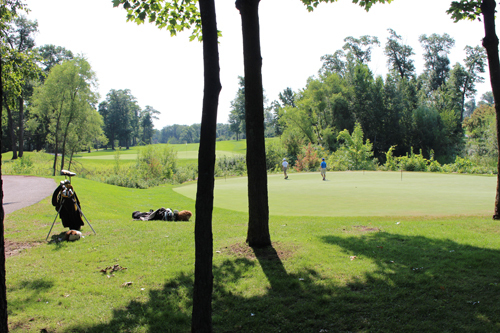 The Classic is part of the Madden’s resort, a 1,000 acre location along the Gull Lake shoreline. It features 63 holes of golf, but The Classic is the star. It started in 1997 and was named “Third Best New Upscale Public Course in North America” and number one ranked public course in Minnesota by Golf Digest. You don’t get to be numero uno by being a fake – golfers and Golf Digest know better. It starts before you even get to the first tee. 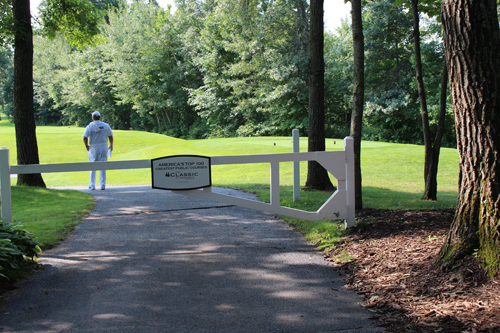 How many courses have a white gate that needs to be opened before you can proceed to the first tee? We cannot think of any other. We loved it. Why? It keeps the hole and the first tee to your group. There are not ten-twelve people milling about by the first tee. When your group gets there, it’s just your group. You don’t feel rushed, nervous (ok – some) due to other golfers watching. That helps in getting off to a good start. The other good start news? The first four holes handicap ratings are as follows: #1 – 15, #2 – 17, #3 – 13, #4 – 11. All double digit. Love it. No 440 yard brute right out of the box. A par 5 opening hole that plays 489 from the whites offers a birdie opportunity. Hole number one is also where folks get their first look at the pristine white Master’s sand in the bunkers. It is so good and plays so consistent, you almost want to hit in to it. Numbers two and three are picture postcard holes as the border the water. Club selection is key and do not get greedy on number three! Play smart and get your-self a short second shot. After hole number four, the course starts to get tough. Handicap holes 1, 3, 5, 7, 9 round out the front side. Number five demands two precise shots – as a number one handicap hole should. A member in our group skipped one of a lily pad in front of the green to get a birdie putt. Hole number seven is a 160 yard par three from the whites but is the seven handicapped hole. Why? It plays longer! Take more club on this hole and get over the sloped front. It is deceptive looking from the tee and you think it is closer. Holes eight and nine are par 4’s, with number eight providing a great backdrop on the approach shot. There is ample room to use driver on both and it is a great way to end the front side. The back begins with a par 5. Golfers love par fives and to have number one and number ten both be par fives is genius. It gives the average golfer a chance at birdie. Number eleven is a short pay four that provides one of the best backgrounds in the state for an approach shot. 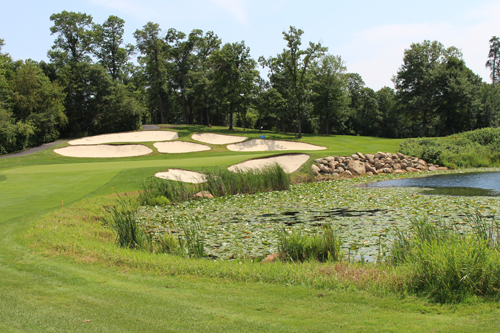 Nine crystal white bunkers frame the green and makes you feel like you at Augusta. Seriously, what other holes in the state, country for that matter, make you feel like you at Augusta? Every golfer’s dream. Hole number twelve, a downhill par three could be the hardest green to putt on as a hump in the middle signals an auto three putt if you are on the wrong side. I bet this green has induced its share of four putts, let alone three putts. Next up – the Beast – at least that’s what the regulars call it. Almost 600 yards long, this par 5 is a double and triple waiting to happen. The sloped front with water short of the green claimed several of our balls. Take more club on your third (possibly 4th) shot. The approach shot makes this hole play longer than it is – if that’s possible for 600 yarder. After the par 3 fourteenth and the par 4 fifteenth comes what most people call the “signature” hole. A reachable par 5 where the green is framed by water and a covered bridge sits on the right hand side. If a bride likes to have her picture taken at a spot (and hundreds have here), you know it must be picturesque! Hole seventeen arrives and you are back at Augusta again. Four beautiful bunkers frame the down-hill par three green that provide a back drop that you could stand and look at all day. The approach at number eleven and the view from the tee at seventeen were the signature moments for this golfer who has long dreamed of attending Augusta. Eighteen is a tournament ending number two handicapped hole at over 400 yards. A little known fact (rumor?). The top days for males to get a procedure done to prevent child birth? Typically April 6th and 7th – the Thursday and Friday of the Masters. That tidbit from a doctor. Why? Because golfers love the visual beauty of the green fairways/greens and the white sand. This golfer has played all over and The Classic is the only course that provides that “Master’s” feeling. Priceless. You need to visit the course to experience that feeling. The staff was first rate and the Golf Shop Operation named Madden’s their Top 50 Service Ace Awards. We could see why. Juniors are golfs future and several were there practicing their chipping and putting. You can view the course in more detail via the link below.